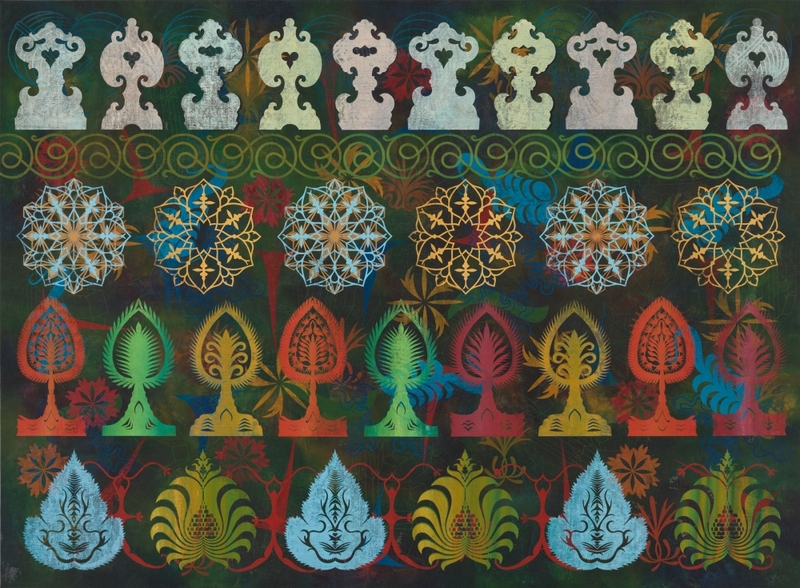 Philip Taaffe, Observatory, 2011. Mixed media on linen. 80 x 110 inches (203.2 x 279.4 cm). "Less Is a Bore: Maximalist Art & Design" brings together works in painting, sculpture, ceramic, dance, furniture design, and more that privilege decoration, pattern, and maximalism. Borrowing its attitude from architect Robert Venturi’s witty retort to Mies van der Rohe’s modernist edict “less is more,” Less Is a Bore shows how artists, including those affiliated with the Pattern & Decoration movement of the 1970s, have sought to rattle the dominance of modernism and minimalism. Encouraged by the pluralism permeating many cultural spheres at the time, these artists accommodated new ideas, modes, and materials, challenging entrenched categories that marginalized non-Western art, fashion, interior design, and applied art. The exhibition considers how artists have used ornamentation, pattern painting, and other decorative modes to critique, subvert, and transform accepted histories related to craft and design, feminism, queerness and gender, beauty and taste, camouflage and masquerade, and multiculturalism and globalism. More recent artworks in the exhibition chart both the legacy and transformation of these trajectories. Spanning generations, geographies, and traditions, "Less Is a Bore" includes works ranging from experiments in patterning by Sanford Biggers, Jasper Johns, and Miriam Schapiro to the transgressive sculpture and furniture of Lucas Samaras and Ettore Sottsass, to the installations of Polly Apfelbaum, Nathalie du Pasquier, and Virgil Marti. Also included are works by Roger Brown, Monir Shahroudy Farmanfarmaian, Jeffrey Gibson, Valerie Jaudon, Joyce Kozloff, Robert Kushner, Ellen Lesperance, Sol LeWitt, Howardena Pindell, Lari Pittman, Pae White, and Betty Woodman, among others.